Jessica Biggs was scared to go to sleep at night. At 32, she had her first heart attack, then a second, third and fourth within a few months. The Smith County schoolteacher couldn’t find answers about the underlying cause until she came to Vanderbilt. The wife, mother and schoolteacher suffered four heart attacks within a few months without knowing why. It wasn’t until she was transferred to Vanderbilt that she finally got an answer: In the emergency department, a Vanderbilt cardiologist diagnosed her with a rare condition called spontaneous coronary artery dissection and put her on a path to appropriate, specialized care. 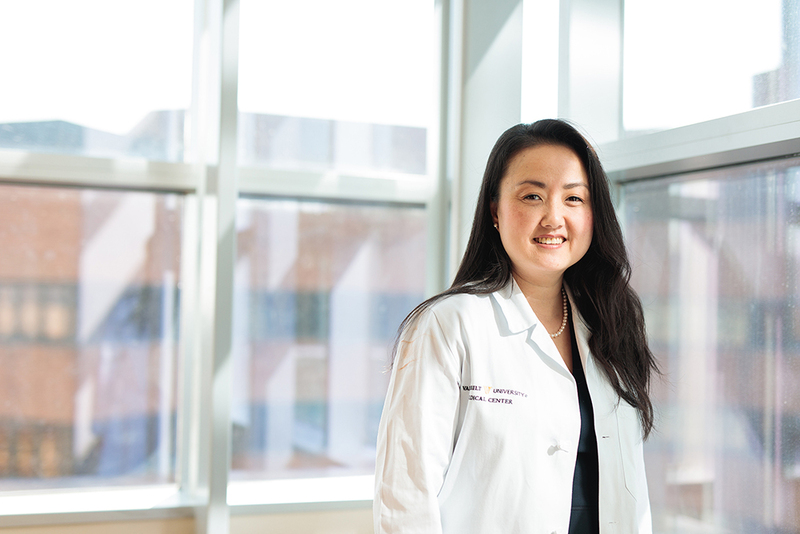 Jessica soon became the first patient in the new Arteriopathy Clinic at the Vanderbilt Heart and Vascular Institute and is now under the care of director Esther S.H. Kim, M.D. Jessica’s four heart attacks weren’t triggered by the usual factors. She had no underlying disease and no high blood pressure. She was a healthy woman in her early 30s, a former basketball player, and an active schoolteacher who taught English, pitching in on PE class and coaching. She had a second job that required travel, a third grader of her own (son Jackson) and an active social life. Then during a business trip to Ohio in June 2016, Jessica began having her first heart attack symptoms, which lasted on and off for three days before they intensified. Even after the pain became so severe that she decided to go to a local emergency room, Jessica waited an hour to call her husband David to take her. Her second heart attack came 12 hours later while she was still hospitalized. In August, four days into the start of the new school year, the pains returned. She was experiencing her third heart attack. Then came a fourth. For almost a year, Jessica rotated through hospitals around her home in Smith County, Tennessee, as she endured four heart attacks and six stent placements. Once, she was told to say her goodbyes to her husband David before being whisked away by helicopter to Nashville. David, who himself has since had open-heart surgery and stent placements at Vanderbilt in 2017, said he was more frightened during Jessica’s experience than during his own. Dr. Kim continues to manage Jessica’s care. SCAD disproportionately affects women, producing heart attacks prompted by spontaneous tearing in the coronary artery wall. Typically, SCAD patients don’t have other risk factors for heart disease. They are otherwise healthy, and may even be young women who have recently given birth. Limited research has been conducted on SCAD, something Dr. Kim and her colleagues are working to change. “Jessica had been through so much with her multiple heart attacks, with her multiple heart catheterizations, her multiple stents, not really understanding why it was happening and not really understanding the diagnosis that she was ultimately given,” Dr. Kim said. Jessica said she sleeps like a baby now. She no longer has a “go bag” by the door in case she has to rush to an emergency room. Jessica now lives a normal life but with some common-sense activity restrictions for patients with "weak" arteries (for example: no roller coasters, scuba diving or lifting heavy objects). Except for one thing: Things that once seemed important, don’t matter as much. Thank you for signing up for updates about Defining Personalized Care. We also invite you to explore health and wellness content on MySouthernHealth.com.